Lipps excelled as a pass receiver and punt returner in college, catching 91 passes for 1477 yards and averaging 10.6 yards on 78 punt returns. 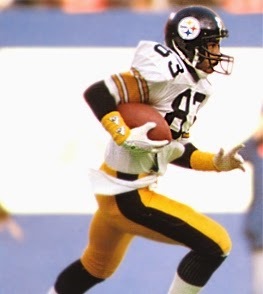 He was chosen by the Steelers in the first round (23rd overall) of the 1984 NFL draft. With his great speed and a solid work ethic, he proved to be a good fit on a young and overachieving team. Steelers went 9-7 to finish first in the AFC Central while leading the NFL in punt return yards (696). Won AFC Divisional playoff over Denver Broncos (24-17). Lost AFC Championship to Miami Dolphins (45-28). Lipps followed up with another Pro Bowl year in 1985, catching 59 passes for 1134 yards (19.2 avg.) and 12 touchdowns while averaging 12.1 yards on 36 punt returns that included two more TDs. Injuries hindered his performance the next two years, and he had just 49 receptions for 754 yards in a total of 17 games over that span. Lipps came back to catch an even 50 passes in each of the next three seasons, from 1988 to ’90, although his high for yards (973) came in ’88. While his speed began to diminish, making him more of a possession receiver than the deep threat he had been originally, he was still reliable and a good runner after the catch, regularly drawing double coverage. In 1991 he had 55 catches, but for just 671 yards (12.2 avg.). He departed for the New Orleans Saints, but appeared in only two games due to injury in what was his last year. Overall, Lipps caught 359 passes for 6019 yards (all but one catch and one yard coming with Pittsburgh) and returned 112 punts for an 11.0 average, scoring a total of 46 touchdowns.